Friday's Forgotten Books is a weekly meme hosted by Patti Abbott at her blog, PATTINASE. My book this week is A.J. 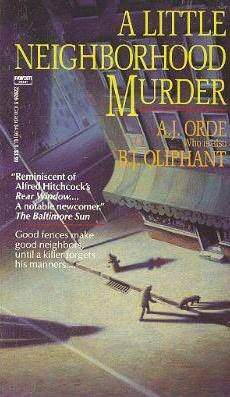 Orde's A LITTLE NEIGHBORHOOD MURDER, a book I'm beginning to think only I have ever read. I've never met anyone else who knows this series, so here's hoping my review will pique your interest. For a list of the rest of the participants in this weekly meme, please check out Patti's blog. Link. A.J. Orde(who is also Sheri S. Tepper, the science fiction writer and B.J. Oliphant mystery writer) wrote the series - beginning with A LITTLE NEIGHBORHOOD MURDER -featuring the enigmatic Jason Lynx over twenty years ago, but that's no excuse for it's seeming invisibility. This is the sort of series that should probably be read in order, since this first book sets up Jason's character pretty well and also explains the mysterious and heartbreaking death of his wife and the equally heartbreaking fate of his small son. Jason Lynx is antiques dealer and interior designer living in Denver. He owns a high-end antiques shop, has a dog named Bela (named after Bela Lugosi), a Hungarian Kuvasz, and leads a generally pleasant life despite the mysteries that plague him. First: who is he? Abandoned as a baby, Jason grew up in an orphanage and was given his name by the nuns there - Lynx, because his blond hair used to tuft out like a lynx cat's. Jason has never given up asking questions about his background, his parents. Second: What happened on the day, 8 years previously, when his wife Agatha, disappeared leaving behind a crashed car and their injured baby son strapped in his seat. His wife's body has never been found and the case is now a cold one. I seldom remember dreams. Oh, I know I dream. Everyone does. Once in a while, when I'm wakened during the night or early in the morning. I have these fragmentary visions of something that has just happened, visions that dissolve almost immediately, leaving me feeling as though I've lost something. It's the kind of feeling I get when when I try to remember the name of an old acquaintance I've seen on the street. It never lasts. That night, however, I dreamed and woke, dreamed and woke, wakened not from the dream but by it. Each time I was in Washington D.C. I was on my way to meet Agatha. We were going to have dinner together when she got off work. There was a little Indonesian restaurant we wanted to try, just four or five blocks off the Mall on Tenth. In the dream, I explained the location to her, describing the way the place looked. I told her I'd meet her in front of the Museum of Natural History, and then, abruptly, I was trying to find the museum myself. I knew it was east of the Washington Monument, on the other side of the History and Technology Museum, but the monument kept moving. Each time I looked it was somewhere else. Streets twisted back on themselves. Some of them rippled and swayed under me. I couldn't get there. I couldn't find the right place. I was afraid I'd miss her. I walked and walked, up and down Constitution Avenue, hunting for the building, but it wasn't there. "I can't wait," she said from some vast distance in the dream. "Jason, I can't wait." Jason's neighbor George Whitney suddenly goes off with his wife Betty giving Jason some frantic story about an accident, and asks Jason to feed their dogs. Jason is curious, but happy enough to comply. George owns the same breed as Jason's - in fact, Bela came from one of his neighbor's litters. When Jason goes over to feed George's dogs in their own kennel out back, he also finds George's front door open. Then he finds the mysterious package. When the bomb explodes, Jason's life takes a bizarre turn as the cops begin to suspect him of some sort of foul play. When the Whitney's are later murdered, Jason wants to find out what the heck happened. Who sent the bomb and why? And who on earth were his neighbors - really? Who would want them dead enough to risk a bomb? Yvette! I haven't read the series...but I do own this particular book and read it about two years ago! I thought it pretty good. I've just never run across any more of the series. Hooray! Now there's you and me, Bev. I don't know why these books are so hard to find. I admit that most of the time I do forget plots and details, but I've never forgotten what happened to Jason's wife and son. Abe Books has some of these titles. This one looks good. Kathy: It is. I hope you'll take a chance and read it. Let me know what you think. Guess what? A local used bookstore here in Chicago has three of these. I thought Jason Lynx was a professional dog walker based on the cover illustrations and the one title. The dog is on all of the covers I saw the other day. I didn't even read the blurbs to find out his being an antique dealer. As Bev is crazy for academic mysteries I cannot resist antique mysteries (and in fact next week's FFB is about one). I also have a fascination with writers who cross over from genre to genre. SO I maybe investigating these soon. This was a good pick. Thanks for clueing me in about Orde and these books. I can always count on you to introduce a series that I've never heard of but really want to read. If you were my only source of reading material, I would still be a happy man. Oh Ryan, thank you. That pleases me no end. I have a big smile on my face. I think you'll like these books, if you can find them. And it looks like maybe they're available here and there. Happy hunting. Yes, your choice of books and recommendations are excellent. My only frustration is with this library system. I guess I have to face facts and become a dedicated patron of Abe Books and buy used books like crazy. Kathy: Thank you, I'm glad you like my recommendations. :) Try Better World Books too. I use them for used books a lot of times. They ship for free and they have a good selection as well.